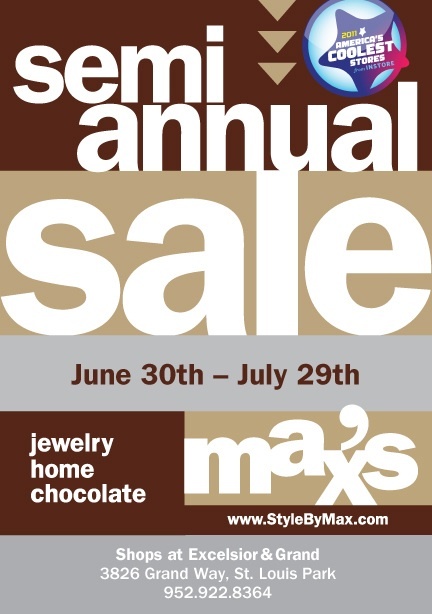 It's That Time of Year — Max's Semi-Annual Sale is ON!!! Posted on June 30, 2012 at 1:03 pm. Yep, it’s that time of year again and I’m serious about it! If it’s on sale, it’s marked down to at least 50% of its original price. Yes, you read that right and while not everything that you’ve been admiring might be on sale, we’re serious about moving out the old to make room for a lot of new. Maybe you’ll be more tempted by our new arrivals….hmmm…decisions…..